Connie Stewart assembles circuit boards for zero- and low-emission vehicles in Torrance. Cleaning the air, one car at a time. When Connie Stewart was a young woman, she dreamt of going into medicine. Today she’s helping Californians stay healthy, but not in the way she imagined. In her blue lab coat, occasionally peering into a microscope, she looks a lot like a medical researcher. But instead of a medical file, she’s reading a schematic for a circuit board she’s assembling in the lab at US Hybrid, an advanced vehicle powertrain supplier in Torrance, located just south of Los Angeles International Airport. Ironically, one of several huge oil refineries in the region is just a few blocks away. US Hybrid is a growing business – and one that’s likely to grow even more as a result of California’s climate justice and clean energy policies. Thanks to zero emission vehicle standards and growing investments under a series of laws that charge polluters and put those dollars to work cleaning the air in our neighborhoods, California not only leads the development of clean transportation technologies but is helping to make them accessible to businesses and individuals. YOU CAN JOIN CALIFORNIA’S CLEAN ENERGY ECONOMY, TOO! You can get help with cutting your energy bill, electric car rebates and making your community cleaner and greener. Find out how! As Connie moves her hand toward the board, a cord that looks like a phone cord attached to her sleeve follows. It’s an antistatic cord, to protect the delicate electronics that form the brain of the all-electric and hybrid vehicles US Hybrid workers assemble in the vehicle integration facility across the street..
Once Connie tests and completes the board, she coats the electronics, giving them a shiny surface, which protects them from water and dust. Depending on the board, it takes her 35-40 minutes to assemble it. She does several in one day. An interest in transportation runs in the family. Connie’s husband is a train engineer, who used to work for Amtrak but now works the freights. Actually, “he’s a train fanatic,” Connie laughs. They live in Culver City, 20 minutes away from US Hybrid. But, what about her dream of working in the medical field? “All that changed when I had my first kid,” she explains. Connie’s son was born one and a half months early and had underdeveloped lungs. He was born with pneumonia. The slightest thing would send him to the ER. “I can’t imagine a parent that would have to go through that medical trauma because of air pollution,” she says. And this is part of why she finds her job so gratifying. Many of US Hybrid’s vehicles are zero emissions vehicles and all reduce emissions over standard vehicle designs. US Hybrid did some of the first hybrid electric trucks used in the ports, where pollution is notoriously high. US Hybrid also deployed the first series of hybrid electric street sweepers in 2010 and released the second batch last year. Currently 13 of them sweep the streets of New York City. “If you can cut down on some of the air pollution and decrease emissions, you are actually doing something in the medical field. We’re cutting down on hospital visits,” she said. Connie’s son is grown up now and completely healthy, but she worries about other kids. Across the street from where Connie assembles the boards, Jarod Doran, Jay Mason and David Gamboa wrestle with an electric drive train in US Hybrid’s vehicle integration facility. They are converting an F250 truck to a hybrid propane/electric system, a prototype funded by the San Joaquin Valley Air Pollution Control District. It will live on a dairy farm in the San Joaquin Valley, where colored flags warn whether or not air quality is good enough for kids to safely go out and play in the playground during recess. Vehicles line each wall of the vehicle integration shop and each one is different from the next, either a prototype or a retrofit from an all fossil-fuel- powered vehicle to something else—electric, propane, hydrogen fuel cell, etc. The huge garage doors are wide open and skylights keep the shop well lit and airy. David Gamboa retrofits a standard drive train to become a clean burning hybrid propane/electric truck at US Hybrid’s vehicle integration facility. Like the people here, the shop is a creative place with the feel of an innovative startup, but the company’s been around since 1999. US Hybrid employs about 55 people in all its facilities— about 40 here in Torrance and the rest in Hawaii and Connecticut— and that number is growing. Torrance may have lost Toyota, but this and many other innovative manufacturers keep growing as they take advantage of an increasing demand for cleaner, more advanced technologies, driven largely by California’s clean energy policies. A 2014 survey of businesses found California is home to more than 40,000 businesses serving advanced energy markets, employing 431,800 Californians – up five percent over 2013. “Research is our big thing,” Jarod says. “If it’s something that hasn’t been done before, we want to do it. Every product is something new for us.” A mechanical engineer, Jarod did the drawings on a lot of these vehicle conversions. He came to California because the push for EVs here is much larger than any other region. He found his calling here. 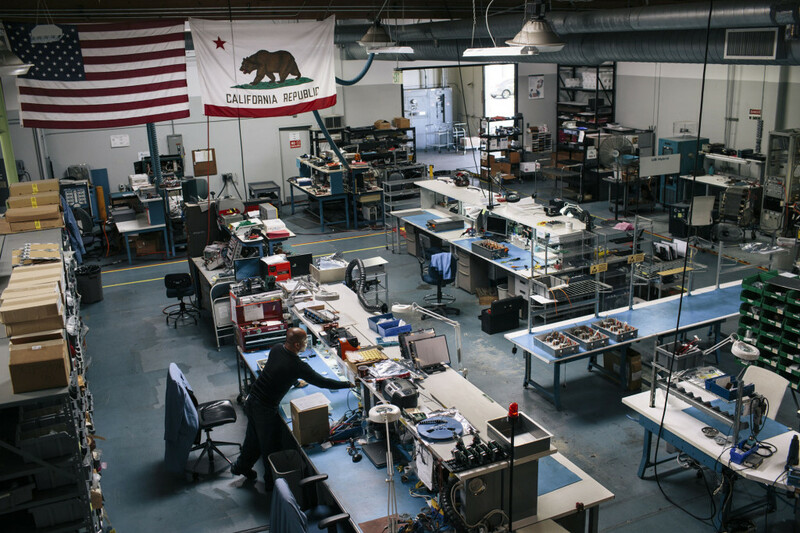 A bird’s eye view of the lab at US Hybrid’s advanced vehicle manufacturing plant. The fight to protect our air, our jobs and our neighborhoods begins with you. Whether you’re an individual, community group or local government, California can help you fight air pollution, access clean energy and clean transit, and much more. UpLiftCA was created by The Greenlining Institute in partnership with the California Climate Equity Coalition, led by the Asian Pacific Environmental Network, Coalition for Clean Air, The Greenlining Institute, Public Advocates and SCOPE. We work to ensure that California climate policies bring opportunities and investments to California’s underserved communities. We are also indebted to the Natural Resources Defense Council for essential support and partnership. Site by Bixler Communications Group.